Ladies and gentlemen, we have a winner. Installation and configuration has ended and I have everything I need on the device. Today was Treo appreciation day. I used the phone throughout the whole day and I enjoyed every minute. I mentioned a few things that need improvement. 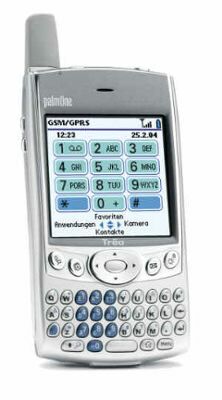 So if PalmOne comes out with a better screen, Bluetooth or WLAN, I am all for it. But today this is the best smart phone on the market. At least, it is the best I ever laid my hands on. I have looked at the Siemens SX1, the SonyEricsson 900 and the XDA2. They may all be fine, but I think I am more of a Palm person. If T-Mobile Germany would finally come out with an affordable flat-fee GPRS pricing, then I might even use the mail client or the web browser. Yeah, fat chance. Until then, this is my new PDA and phone. It does not win the editor-refuses-to-give-it-back award. It wins the over-my-dead-body award.